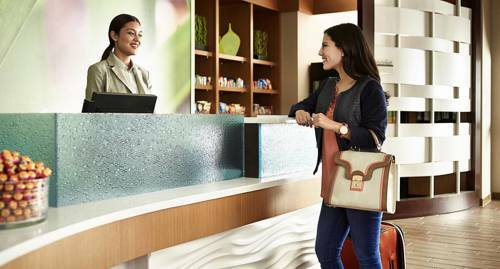 Travel in style at SpringHill Suites by Marriott , the all-suite hotel that seamlessly blends design and functionality offering the modern amenities you need to stay refreshed and focused - all at an affordable price. Spacious suites and vibrant lobbies offer flexible spaces perfect for working, meeting or relaxing. Take the stress out of travel with free Wi-Fi, relaxing pool and fitness center. Our Market is open 24/7 for snacks and necessities. Enjoy our complimentary new breakfast with fresh choices; like eggs with local salsa or Greek yogurt and oatmeal complete with a toppings bar for a variety of options. Quite simply, from business trips to leisurely journeys, SpringHill Suites is a breath of fresh air. We are centrally located off FM 1960/Hwy 6, close to Memorial Herman Hospital, Wyman Gordon, TIFCO, Stewart & Stevenson, GE Oil & Gas, Siemens, Oceaneering International and other corporate keaders. For the leisure traveler, we are close to Lindsay Lakes, Berry Center and Houston Premium Outlet Mall.